An extended version of this article was originally published on the PBS Station Products & Innovation Blog. OETA/Oklahoma PBS was beyond excited to participate in digital video training conducted by PBS Digital Studios', "Indie Alaska” and "Indie America" producers Slavik Boyechko and Travis Gilmour. 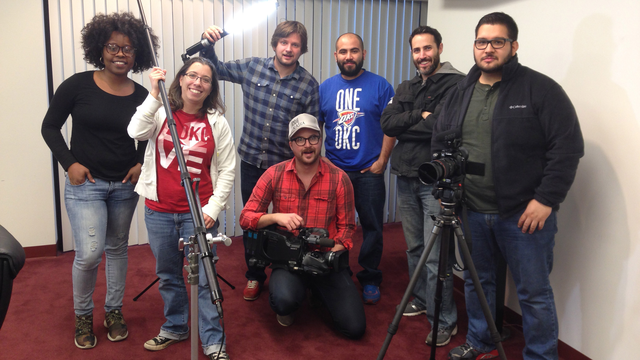 The crew visited OETA for a three day crash course in all things digital. The training delivered unique expertise on production techniques, work flow and filming with a minimal budget. From a marketing/communications perspective, I was interested to learn promotional strategies and how to make more effective, affecting testimonials (like these from Slavik and Travis). Slavik and Travis broke down their process and clearly explained it step by step. It was collaborative and it was motivating. We have the tools now - as a team - to take our digital content game to the next level. Before Slavik and Travis arrived for training, they spent a day shooting the first of two “Indie America” Oklahoma installments. They used this footage as the basis for training on days one and two. Day two was when the “Indie America” team brought their cool toys and made everyone jealous: Canon C-100 DSLR cameras, lenses, tripods, monopods, key lights, fill lights, booms, lav mics, shotgun mics, and the ‘slider’ (a camera mount used to achieve their signature sliding camera shots) were at our disposal. Slavik kicked off the day with a discussion of how to tweak camera settings (frame rate, aperture, ISO, etc.) and establish shallow depth of field in shots to achieve a cinematic look. Two members of our production team tagged along with Slavik and Travis in the field for a live shoot on the last day of training. The biggest takeaway from the day was that getting out of the studio and into your subject’s native environment helps create effective, compelling content.